Santa Fe, NM. The Inn and Spa at Loretto, opened 1975. The rounded, stucco surfaces and projecting vigas are a hallmark of this style. HISTORICAL BACKGROUND AND FEATURES: Just as the Mission style was the “California counterpart” to the Northeast’s popular colonial revival style, the Santa Fe style was a reaction to the Mission style of southern California. Basically, the “taste-makers” of Santa Fe and the state of New Mexico wished to distinguish themselves from the spreading image of southern California. Also, with New Mexico gaining status as a new state in 1912, the development of the new style was perceived as useful to attract tourists and promote the new state’s own identity (as perceived by Anglo-Americans there). 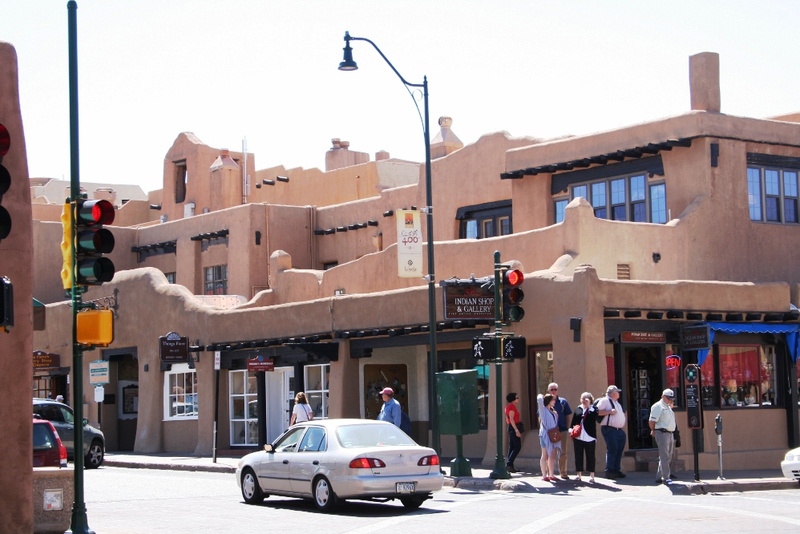 Instead of “The City Beautiful,” as other cities responded to the City Beautiful movement, Santa Fe became marketed as “The City Different”. 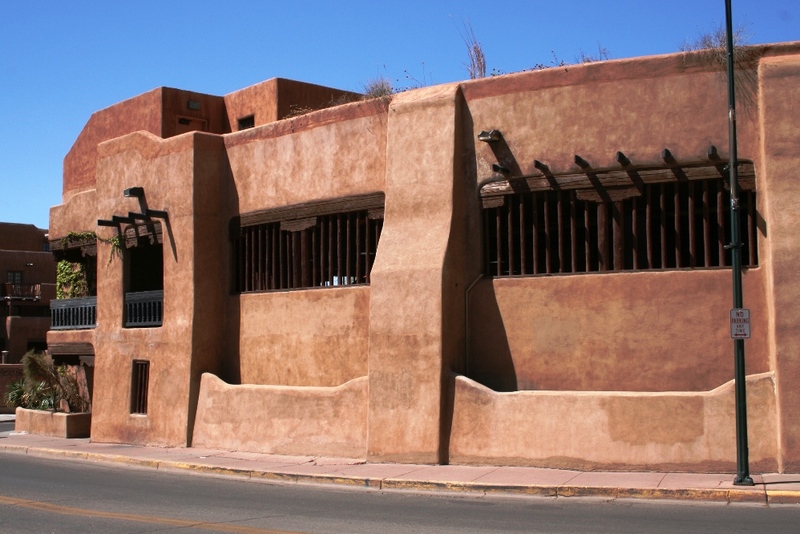 The style was basically inspired by a mixture of Spanish Colonial, mission, and Indian Pueblo architectural forms. Prior to its prolific use in Santa Fe, early prototypes of the style appeared in California during the 1890s and later at the University of New Mexico, Albuquerque. It quickly became the regional style of Anglo-American, northern New Mexico after 1912. 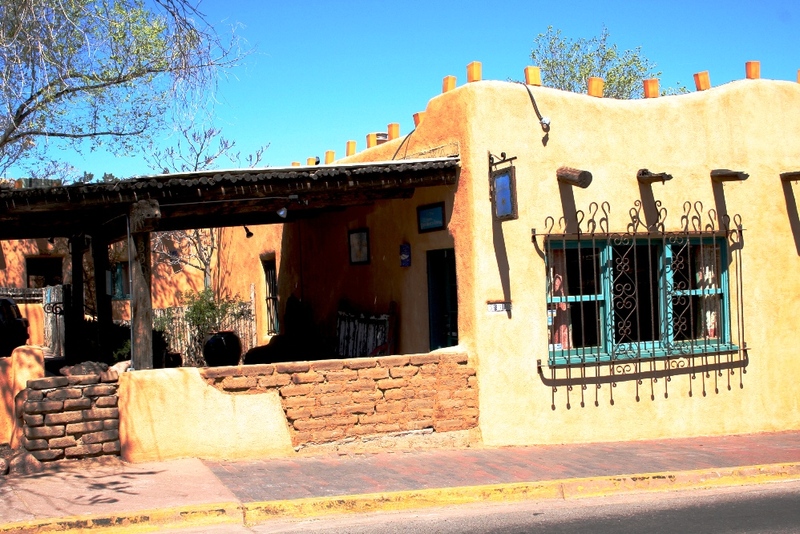 Thus, it is often referred to as Santa Fe Style. 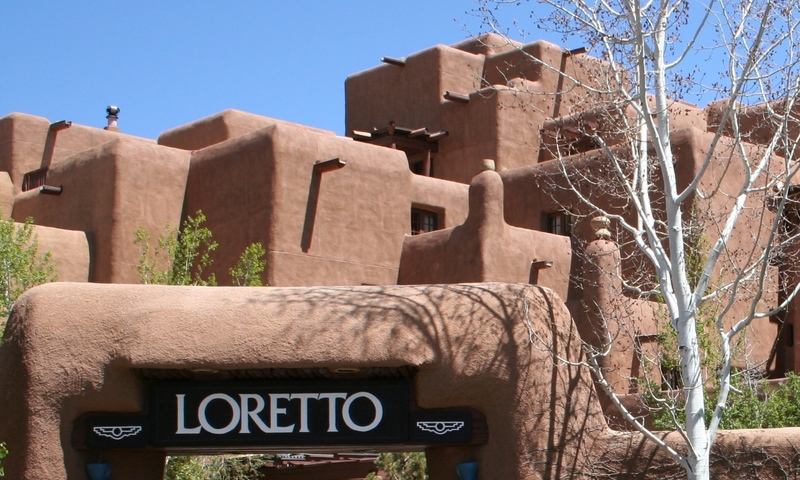 The first structure to gain the new style in Santa Fe was the Palace of the Governors. Features include flat roof with parapeted wall, gently rounded edges to walls, stucco cladding, and vigas (thick, round roof beams) extending out of the roofline. More recently, the style has become popular outside of New Mexico, in places such as Arizona and southern California. Still, its core area consists of northern New Mexico and the style still creates a distinct (even if contrived) Anglo-American identity for the “Land of Enchantment”. For More Photos of Pueblo Revival on Flickr, Click Here. Santa Fe, NM. A pueblo revival parking garage near the plaza. Santa Fe, NM. Projecting vigas, smooth surface, rounded parapet above the roofline, and brick veneer designed to appear weathered and crumbling. Santa Fe, NM. c. 1922. 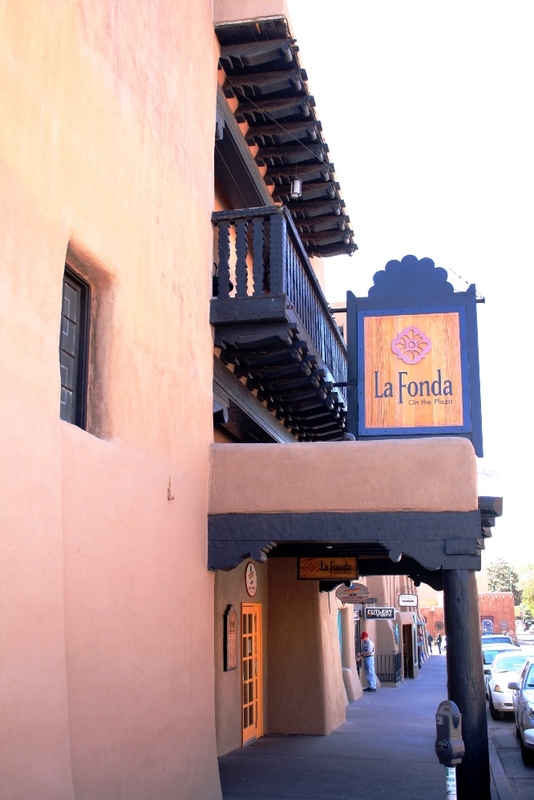 La Fonda Hotel, which was acquired by the AT&SF (Santa Fe) Railway in 1925 and leased to the Fred Harvey Co. Interior designed by Mary E.J. Colter.